When you think of Vietnamese food, most people will have pho on their minds. It is the country’s national dish after all. You can find Pho in just about every street corner in Vietnam. The most common Pho is Pho Bo, or Beef Pho but you can easily find other variations such as Pho Ga (Chicken Pho). While we tried our best to find the best Pho Bo in random alleyways and street corners, our favourite Pho was still the one at Pho Phuong 25, a pho joint just beside the famous Lunch Lady. Besides the tender cuts of beef and generous portions of other beef parts such as tendon and beef balls, the broth of their pho bo is just sensational. The slightly darker clear broth brimmed with flavour and each mouthful bore an intense meaty quality. Your trip to Ho Chi Minh City will not be complete without a trip here. 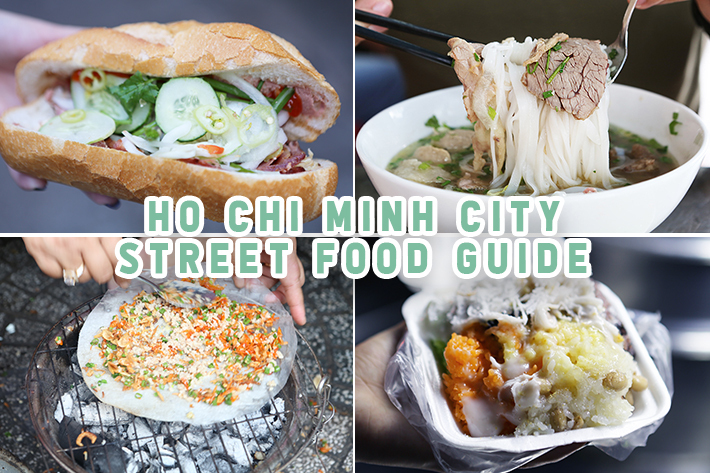 Verdict: #1 must-try street food Ho Chi Minh City. Whenever you need a quick and satisfying bite on the go in Vietnam, people go right for a Bahn Mi, a Vietnamese baguette sandwich popular all over the world. Like Pho, Bahn Mi is found is every street corner, available in fancy food joints and street stalls any where in Ho Chi Minh City. Bahn Mi usually features a baguette sandwich with pork paté, a variety of cooked meats, Vietnamese hams and sausages, pickled vegetables, chilli, coriander and more. You can also customise your own Bahn Mi in most places. While we thoroughly enjoyed the Bahn Mis we had in Ho Chi Minh City, nothing really stood out for us. Verdict: Worth a try just for the experience. . 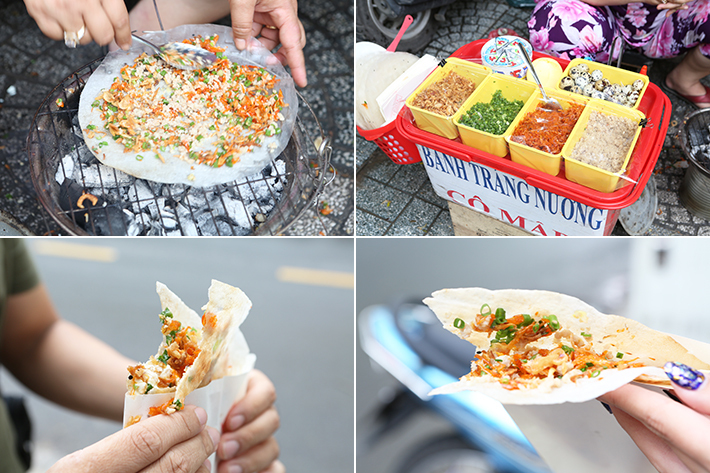 While strolling around in the city, we passed by a couple of road-side stalls offering the Bánh Tráng Nuong. It is a type of rice cracker more commonly found in Ho Chi Minh City (in Southern Vietnam). A rice paper sheet is toasted over a charcoal fire to a nice crisp before being topped up with ingredients such as diced vegetables, cream cheese, quail eggs, minced meat and a variety of sauces. For just about S$1, this pancake was one of the highlights of our trip. Each bite was an explosion of savoury, umami flavours and each bite came with a pleasant crunch. If you see a stall like this around Ho Chi Minh City, do not hesitate! Verdict: Extremely satisfying, a must to try if you see it around. 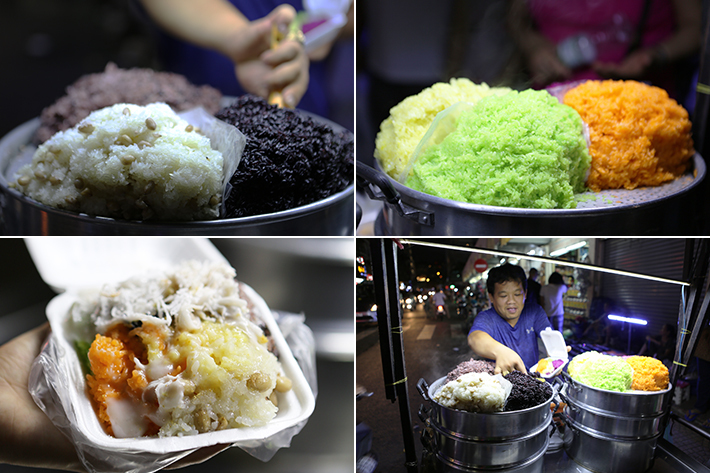 When strolling around the Phan Boi Chau Night Market, we were privy to a street cart offering gorgeous colourful glutinous rice desserts topped with coconut cream and desiccated coconut. We quickly ordered up a serving without first asking for a price. We chose a mix of colours and the total came up to about S$9 for a pathetically small portion. The sticky rice was hard and not cooked well and the coconut cream made the taste one dimensional. We quickly tossed the dessert away after a bite or two because it was that bad. These street carts hang around the night market and serve tourists exclusively to trick them into buying a portion. You have been warned! Verdict: Do not try unless you’re recommended by a local. Check the prices beforehand. You can find Goi Cuon or Vietnamese Spring Rolls every where in Vietnam. In Ho Chi Minh City, you can find street vendors offering them and restaurants serving them as a start or side. On our trip to Ho Chi Minh City, we realised that many locals enjoy this dish as a full-fledged meal. They would gobble up 4 to 6 of these rolls before going about the rest of their day. We are huge fans of Vietnamese Spring Rolls and each refreshing bite really whets our appetites for more food. Each roll features rice wrappers stuffed with shrimp, Thai basil, mint leaves, coriander, lettuce and more. Dip it in some hoisin sauce and you’re good to go. Verdict: Must-try street food, easy to consume and great for any time of the day.